We are calling for the UK government to act on climate change. Not just to do something – to do enough to avoid climate chaos. This means investment not in new fossil fuels but in renewables – massive amounts. It means saving energy by insulating and converting all homes and all public and private buildings, and a shift from cars to public transport. It means a dedicated workforce to create this infrastructure – one million climate jobs. And it means the UK supporting a global agreement to cut warming emissions of all kinds, speedily, with fairness and justice. Far from taking concerted action to avoid the threat of catastrophic climate change, since its election in May 2015, the government has been taking us in entirely the wrong direction. 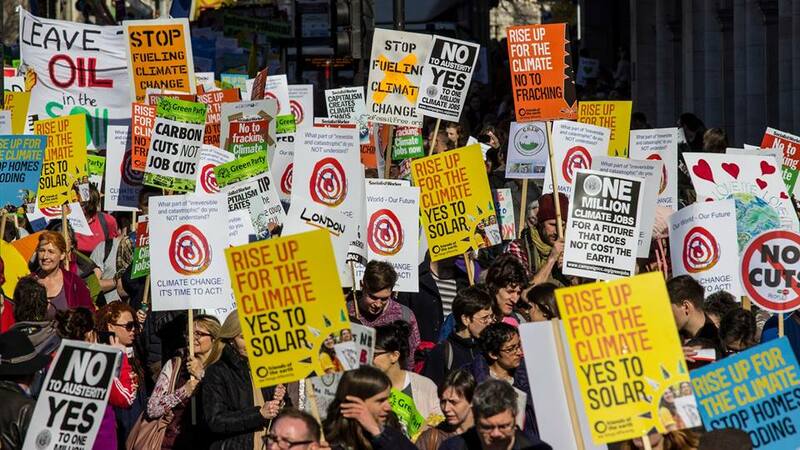 With dramatic cuts to renewables funding, clean energy technology has been sidelined, insulation funding has also been cut and fracking, roads and runways pushed through despite strong local opposition. Find out more about how David Cameron's government failed to keep their promises and how Theresa May's actions continue to go down the wrong direction, with the approval of another runway at Heathrow.